Shortly after the Revolution, the western frontier of the new United States ran through the Genesee Valley. There were many who wanted to settle this "wild west", but before they could several things had to be done. First, a dispute over the land between the young states of Massachusetts and New York had to be settled. Both claimed the lands had been given to them by the King when they were colonies, and both were determined to make them part of their state. Finally in 1786 a compromise was made and the western lands, including those which would become Letchworth Park, became part of Massachusetts! The agreement specified, however, that as soon as the lands were sold they would revert to New York State, with Massachusetts pocketing the profits. That happened over the next decade in a series of sales to land speculators such as Robert Morris, Gerrit Cottringer, and the Holland Land Company. The Indian Title to most of the Genesee Valley was extinguished in the Big Tree Treaty of 1797, and soon pioneers poured into the rich river lands. The flats to the North and east of the Park were settled first, since most settlers preferred less rugged lands than those found along the Portage Gorge. So it wasn't until 1816 that the first pioneers arrived in the heart of the present day Park. Reuben and Perry Jones arrived in that year and began to carve a home and living from the thick forests near the present day Visitor Center, paying about $2.00 an acre for over 300 acres of land. Soon others joined them. Alvah Palmer was the first settler near the Middle Falls, building a cabin at the site of the present day Glen Iris Inn. He erected the first mill on the Middle Falls in 1824. 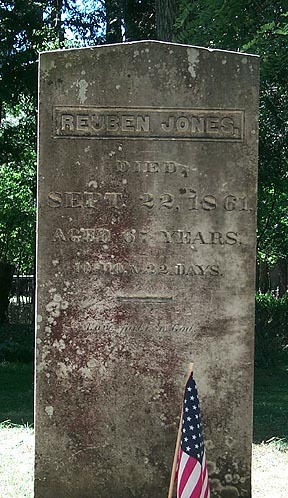 Right: Gravestone of the pioneer Reuben Jones found in the Pioneer Cemetery at Letchworth Park. Over the next few years enough settlers arrived to clear the forests and start communities. Two villages took shape in the future Park's land - Gibsonville to the north and St.Helena below the Lower Falls. They soon would thrive on farming, lumbering, and the production of potash. The sons of these pioneers witnessed a tremendous transformation in the Valley. Soon work began on the Genesee Valley Canal, a manmade river connecting the Erie Canal in Rochester to the Allegany/Ohio/Mississippi River systems. The Canal, completed in 1862, was pinned high to the eastern cliff of the Portage gorge. Soon a railroad was also built, crossing the River on a great wooden bridge just above the Upper Falls. Now the products of Portage could reach anywhere in America and the world. But the economic progress of the pioneer era took a heavy toll on the land. The Middle Falls, for example, was harnessed by a complex of mills fed by the ancient trees of the nearby forests. The beauty of the Valley was quickly disappearing, and it would take someone special to save it. That man was a wealthy Buffalo business man by the name of William Pryor Letchworth.